Sometime in the next few years (if it hasn’t happened already) the world will reach a milestone: half of humanity will be having only enough children to replace itself. That is, the fertility rate of half the world will be 2.1 or below. This is the “replacement level of fertility”, the magic number that causes a country’s population to slow down and eventually to stabilise. According to the United Nations population division, 2.9 billion people out of a total of 6.5 billion were living in countries at or below this point in 2000-05. The number will rise to 3.4 billion out of 7 billion in the early 2010s and to over 50% in the middle of the next decade. The countries include not only Russia and Japan but Brazil, Indonesia, China and even south India. Higher standards of living, then, reduce fertility. And lower fertility improves living standards. This is what China’s government says. It is also the view that has emerged from demographic research over the past 20 years. In the 1980s, population was regarded as relatively unimportant to economic performance. American delegates told a UN conference in 1984 that “population growth is, in and of itself, neither good nor bad; it is a neutral phenomenon.” Recent research suggests otherwise. Cutting the fertility rate from six to two can help an economy in several ways. First, as fertility falls it changes the structure of the population, increasing the size of the workforce relative to the numbers of children and old people. When fertility is high and a country is young (median age below 20), there are huge numbers of children and the overall dependency ratio is high. When a country is ageing (median age above 40), it again has a high dependency ratio, this time because of old people. But the switch from one to the other produces a Goldilocks generation. Because fertility is falling, there are relatively few children. Because of high mortality earlier, there are relatively few grandparents. Instead, countries have a bulge of working-age adults. This happened to Europe after the baby boom of 1945-65 and produced les trente glorieuses (30 years of growth). It is happening now in Asia and Latin America. 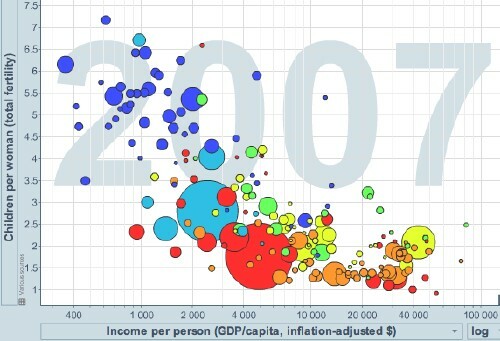 East Asia has done better than Latin America, showing that lower fertility alone does not determine economic success. Eventually developing countries will face the same problems of ageing as Europe and Japan do. But for the moment, Asians and Latinos are enjoying fertility that is neither too hot, nor too cold. According to David Bloom of the Harvard School of Public Health, the “demographic dividend” (his term) accounted for a third of East Asian growth in 1965-90. Slowing fertility has other benefits. By making it easier for women to work, it boosts the size of the labour force. Because there are fewer dependent children and old people, households have more money left for savings, which can be ploughed into investment. Chinese household savings (obviously influenced by many things, not just demography) reached almost 25% of GDP in 2008, helping to finance investment of an unprecedented 40% of GDP. This in turn accounted for practically all the increase in Chinese GDP in the first half of this year. This link between growth and fertility raises awkward questions. In the 1980s the link was downplayed in reaction to Malthusian alarms of the 1970s, when it was fashionable to argue that population growth had to be reined in because oil and natural resources were running short. So if population does matter after all, does that mean the Malthusians were right? Not entirely. Neo-Malthusians think the world has too many people. But for most countries, the population questions that matter most are either: do we have enough people to support an ageing society? Or: how can we take advantage of having just the right number for economic growth? It is fair to say that these perceptions are not mutually exclusive. The world might indeed have the right numbers to boost growth and still have too many for the environment. The right response to that, though, would be to curb pollution and try to alter the pattern of growth to make it less resource-intensive, rather than to control population directly. The reason is that widening replacement-level fertility means population growth is slowing down anyway. A further reduction of fertility would be possible if family planning were spread to the parts of the world which do not yet have it (notably Africa). But that would only reduce the growth in the world’s numbers from 9.2 billion in 2050 to, say, 8.5 billion. To go further would probably require draconian measures, such as sterilisation or one-child policies. The bad news is that the girls who will give birth to the coming, larger generations have already been born. The good news is that they will want far fewer children than their mothers or grandmothers did. In the latest issue of Ecology and Society, Peter Potapov et al’s article Mapping the world’s intact forest landscapes by remote sensing. (Ecology and Society 13(2): 51). 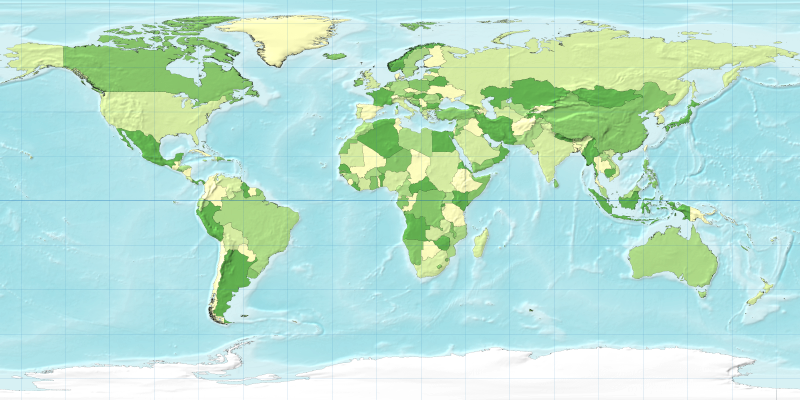 Shows a new map of global forests – showing the “intact forest” areas that are not directly transformed by human action. 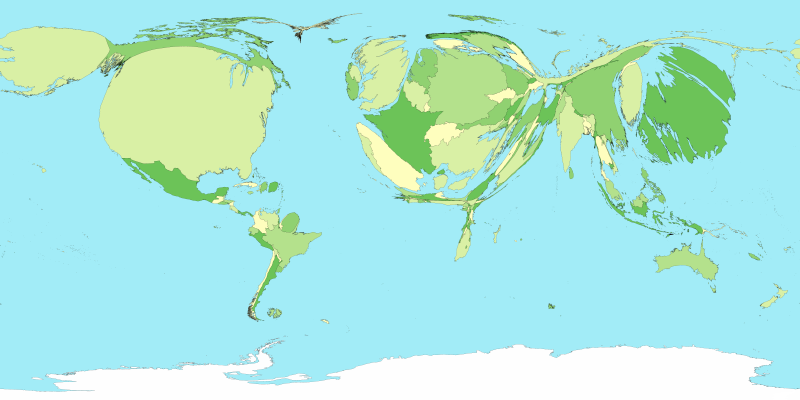 The world’s intact forest landscapes (IFLs): IFL (green), Forest zone outside IFL (yellow). as an unbroken expanse of natural ecosystems within the zone of current forest extent, showing no signs of significant human activity, and large enough that all native biodiversity, including viable populations of wide-ranging species, could be maintained. 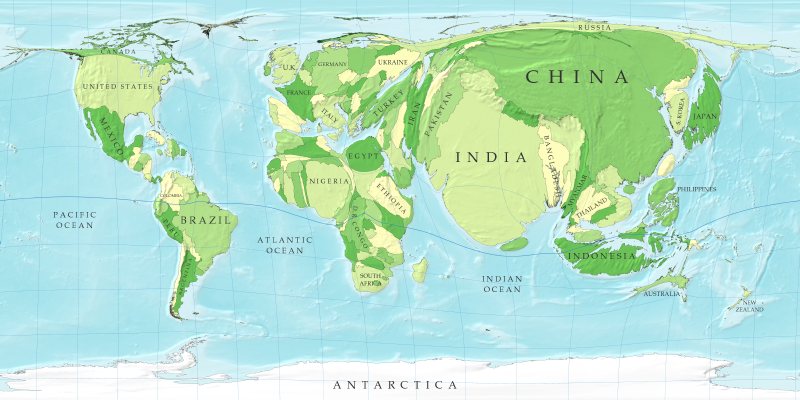 Although all IFLs are within the forest zone, some may contain extensive naturally treeless areas, including grasslands, wetlands, lakes, alpine areas, and ice. The data can be downloaded from the projects website as tiff, google earth, or shapefiles. significantly less intact area in boreal forests than the World’s Wilderness Areas analysis (McCloskey and Spalding 1989) and the Frontier Forests analysis (Bryant et al. 1997) because of our more recent data allowing us to capture the effect of the expansion of oil and gas extraction infrastructure in Canada and Siberia, as well as the role of extensive human-caused fires accompanying industrial development of northern forests. 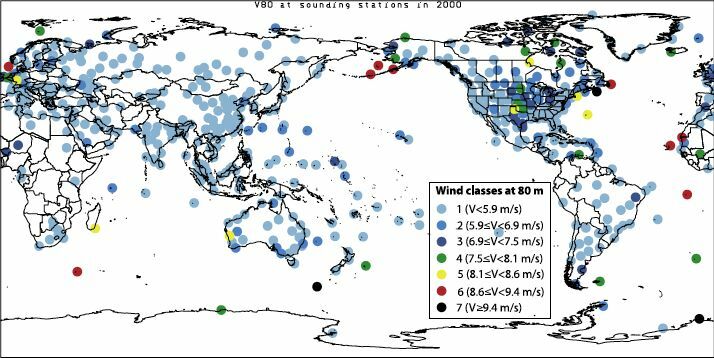 more intact areas in dense tropical forests (the Amazon and Congo basins) and in boreal mountains (southern and eastern Siberia, Kamchatka, Alaska, and the Canadian Rocky Mountains) than was found in previous studies based on coarse-scale map and expert data analysis. 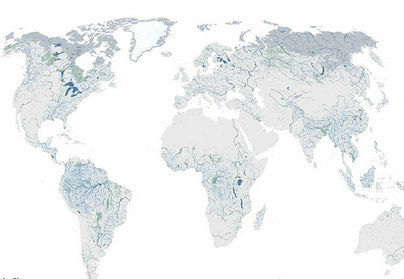 the Human Footprint data set (Sanderson et al. 2002), which finds a significantly larger area to be intact within boreal regions and the southern part of the Amazon Basin in Brazil. Both areas were developed (by industrial logging and oil and gas extraction in Canada and Russia, and by agricultural clearing in Brazil) in recent decades, and these changes were not captured in the Human Footprint assessment. 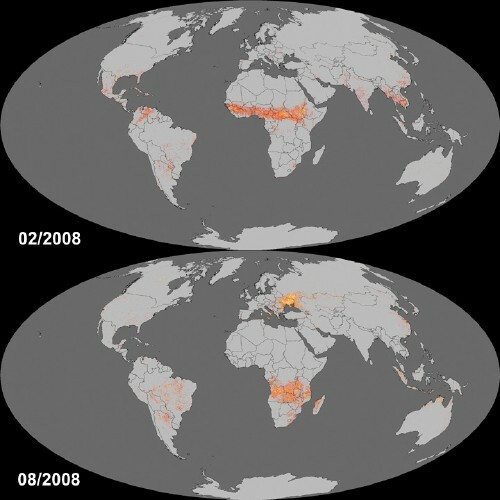 in some regions (i.e., Central Africa, boreal forests in Siberia and Canada) we found a smaller area to be intact than the Human Footprint map because we classified burned areas in the vicinity of infrastructure as not intact. The Landscape Domestication Analysis by The Nature Conservancy, which relied on existing transportation network maps, also overestimated the intact area (Kareiva et al. 2007). Malaria Atlas Project used national reports, ecological and epidemological models to create a new global map of P. falciparum malaria risk. Guerra et al 2008 PLoS Medicine estimate that 2.37 billion people live in areas at risk of P. falciparum transmission. However, almost a billion people of those people live in areas with only episodic or very low risk of malaria exposuire suggesting there in substantial possibility of eliminating malaria from these areas. Almost all areas with high risk are in Africa. Their maps can be viewed in google earth, as country maps, or as as an ArcGrid file at 0.1 degree spatial resolution.